Welcome to the 2016 football season and our first edition of The Pick List. Each Thursday throughout the regular season, The Pick List will feature six of the best match-ups across the state, and make our predictions on a handful of other games. The Eastern Kansas League season opens with perhaps the most anticipated game of the season as two-time defending 4A-I champion Bishop Miege travels to Blue Valley. Last season the Stags and Tigers met in Week 3 with Blue Valley building a 14-point lead in the third quarter and holding off Miege 42-35. It ended up being Miege’s only loss of the season. On that night, Blue Valley controlled the Miege offense by focusing on their own ground game and keeping Miege off the field. The Tigers rushed for 408 yards behind the trio of A.J. Totta, William Evans, and quarterback Colton McCumber. Miege played without all-state running back Dawson Downing, and thus relied on quarterback Carter Putz’s 358 passing yards. The Blue Valley secondary had difficulty in containing Jafar Armstrong who caught seven passes for 187 yards and two scores. Back-up running back Cameron Clark rushed for 88 yards and a score for the Stags. Both teams have high expectations again this season. Bishop Miege returns thirteen total starters including explosive players on offense in Armstrong and Putz. Armstrong, a Missouri commit, caught 65 balls for 1,262 yards and 15 touchdowns last season. Meanwhile, Putz’s sophomore line included a 69 percent completion rate, 3,187 passing yards, and 36 touchdowns against only five interceptions. Colin Grunhard (6-1, 275) returns to lead the offensive line. The Stag defense looks to be just as impressive with six starters returning. Linebacker Joe Watskey will lead the defense, and Iowa Hawkeye commit Djimon Colbert will join Landry Weber in the defensive secondary. Blue Valley returns six offensive starters and two starters on defense. Evans returns in the Tiger backfield after rushing for nearly 1,000 yards and 12 touchdowns. He’ll follow all-state lineman Kirrian Kirby (6-4, 270) and two other starters up front. The Tigers have a solid receiving group with Gus Gomez and Harrison VanDyne returning. On defense, the Tigers return an all-state selection in linebacker Michael Maffry. Maffry recorded 172 tackles including seven tackles for loss, three sacks, and an interception last fall. This game has all the ingredients of a late-season, playoff showdown. There will likely be some early-season mistakes, but the team that can limit those will get a head up on the ultra-competitive EKL. A pair of tradition-rich programs will unveil relatively inexperienced teams as Olathe North travels to Wichita Heights. Olathe North reached the 6A sub-state semifinals a season ago before falling 43-19 to Blue Valley. Wichita Heights produced a 7-4 season that ended with a 44-14 loss to Bishop Carroll in the Class 5A quarterfinals. 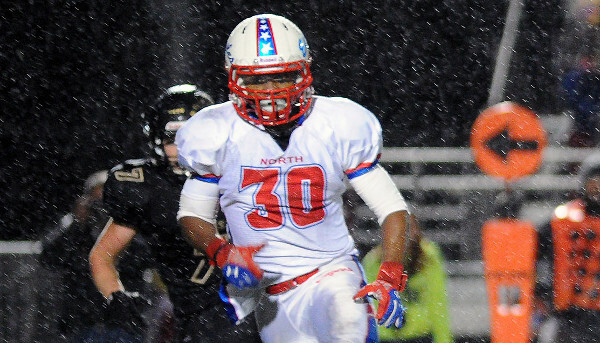 Olathe North returns only a handful of starters from last season’s 10-2 campaign. Chris McCartney’s Eagles must replace Kpreps 6A All-State selections in running back Vinnie Shabazz and receiver Isaiah Simmons. Shabazz rushed for 1,963 yards and 25 touchdowns a season ago, while Simmons had 994 receiving yards and 13 scores. Perhaps even more significant was the departure of underrated quarterback Matt Wright who passed for 1,543 yards and 19 touchdowns and added 1,060 rushing yards and 12 more scores. North may look to running back/safety Deion Poindexter and lineman Wyatt Creek to lead an inexperienced group. Poindexter rushed for 111 yards and a touchdown on 24 carries last season. The defense is in better position with linebackers Jonya Boyd and Ryan Huck, while Malik Baynum-Browne joins Poindexter in the secondary. Wichita Heights will also be looking for answers to replace an all-state running back. Rodney Murphy is gone after an all-5A season in which he rushed for 1,513 yards and 30 touchdowns. Junior Dejuan Scott returns in the backfield and will run behind lineman Camron Fisher and tight end Alton Guidry. Sophomore K’Vonte Baker will start at quarterback and features break-away speed. The Falcon defense will miss standout safety Creighton Sanders, but return seven starters to build around. That includes linebacker Javeon Jackson, who could be poised for a big season with the help of defensive linemen Austin McCartney and Dalen Williams. The Eagles and Falcons have only met twice in their history and the circumstances were significant. Olathe North defeated Heights 37-3 in the 2009 Class 6A state championship game, while Heights topped the Eagles 48-14 the following year to win the 2010 crown. Heights would go on to appear in a third consecutive 6A title game in 2011 falling to Olathe South, 41-37. Last fall, the Grizzlies opened the year with a 31-24 upset of Carroll, which had finished 13-0 and won the Class 5A state championship the previous season. Northwest eventually won the City League and finished 10-1, its first conference crown since ’05 and second in 21 seasons. Carroll eventually went 11-2 and lost to Mill Valley in the 5A title game despite a bevy of injuries. Northwest’s blur offense is one of the fastest-paced attacks in Kansas, and was second in yards per game behind Rossville. The Grizzlies averaged 48 points, 72 snaps and 539 yards per contest. In last year’s game against Carroll, the Grizzlies featured 80 snaps and 26 first downs; Carroll recorded 66 snaps and 16 first downs. It marked the Golden Eagles’ first City League loss since a season-opening defeat versus Wichita Heights in 2011. Senior running back Jahlyl Rounds paces Northwest’s offense after collecting 1,326 yards and 14 scores a season ago. Rounds had 15 carries for 79 yards and two scores in the Carroll win. However, Northwest graduated standout dual-threat quarterback Kevin Folsom (219 passing, 129 rushing versus Carroll). Folsom accounted for 37 TDs, though missed parts of the last two seasons with injuries and backups played well in his place. Wide receiver Martese Mullins returns after he set school marks for receptions (45) and receiving yards (880) along with 11 receiving scores. Senior lineman Joey Gilbertson is a KU commit. Junior Austin Anderson is expected to take over under center. Senior Emilio San Roman finished with a team-high 93 tackles but is the only one of the top nine tacklers back. Following the loss, Carroll returned to its usual form and didn’t have a game closer than 22 points until late October. It won its three playoff games by 17, 27 and 27 points before a 35-14 defeat to Mill Valley. Carroll permitted just 189 points, fifth-best in 5A. The Golden Eagles return running back Adam Theis, who rushed for nearly 1,300 yards and 30 scores. Carroll has played for a state title in three of the past four seasons with two crowns under longtime coach Alan Schuckman. The defensive line with Martin Esquivel, Robert Garcia, John Henry Marx and Isaiah Carter is a strength. Junior Braden Howell, who played well in the postseason last year because of an injury, is expected to take over at quarterback. While the league will have several contenders, the winner of this contest will have the inside track to the City League title. The slight difference will be line play and Carroll’s experience at quarterback. Northwest will score points, but Carroll is one of the few teams that can slow the Grizzlies just enough. Holcomb collected the first state football title in school history and the first crown for coach Kent Teeter, who has served significant stints with Hays High and Goodland before joining the Longhorns. Holcomb went 11-2, with GWAC losses to Scott City and Ulysses, before reeling off nine straight victories. Quarterback Trey Teeter, Kent’s son, led the spread offense to 35.2 points a contest. The underrated defense permitted just 10.1 points per contest, best in the classification, and shut out Holton, 21-0, in the state title game. Holcomb returns the Class 4A, Division II Defensive Player of the Year in Dillon Williams, who finished with 145 tackles. On offense Williams rushed 128 times for 899 yards and 14 scores. Seniors Brandon Stegman (423 rushing yards) and Conner VanCleave return, too. VanCleave tallied 78 tackles, 270 receiving yards and led the team with 11 TFLs and seven sacks. Junior quarterback Trey Gilbert is expected to take over under center. Cimarron, expected to improve in Class 3A, went 6-4 each of the last two years. Second-year coach Jason Stithem was asked to resign shortly before the season started with Chuck Dirks taking over. The Bluejays fell 76-19 to Hoisington in the first round of the playoffs last season and lost by 42 to the Cardinals in ’14. The Bluejays return 10 starters on both sides of the ball, including standout quarterback Nick Ast. Ast (6-6, 185) has already set school records for passing yards and total yards. A state champion hurdler, Ast passed for 1,245 yards, rushed for 702 and accounted for 28 scores. Cimarron’s offense tallied 38.2 points a contest but its defense allowed 29.8. In 2014, under then-coach Randall Rath (who’s known for defense), the Bluejays tallied 29 points a game but allowed 19.4. From ’04-15, Holcomb is 10-0 against Cimarron, including a 48-8 victory last fall. In 2004, Holcomb won 28-27 followed by a 15-0 victory the following season. Since then, Cimarron has scored just 55 points in eight meetings and no game is closer than 19 points. Cimarron will have the closest margin in the last decade, but Holcomb’s defense will keep Ast in check. Garden Plain defeated Hesston, 22-21, in overtime the first round of the Class 3A playoffs last season. The Swathers never trailed in the contest before the Owls went for two in overtime. Hesston won the yardage battle 299-282, but Garden Plain had 10 more plays and dominated the time of possession. The Owls had the ball for nearly 31 minutes, almost 14 more than Hesston. Hesston (8-2) allowed just 8.6 points per contest, the classification’s best scoring defense. The Swathers return all but three of their rushing yards, including dual-threat quarterback Zach Esau (1,326 passing, 695 rushing, 29 TDs accounted for). Senior Zach Vogt is back after he caught 31 passes for 559 yards and 10 TDs. Coach Clint Rider (26-5) has achieved the difficult task of continuing to replace standout offensive players (Ryan Schadler and Grant Raleigh) and continuing to keep the offense at a high level. Hesston averaged 32.6 points a contest in 2015, followed by 46.5 in ’14, 39.2 in ’13 and 34.6 in ’12. GP (9-2) also enjoyed a standout defense that allowed just 15 points per contest. Garden Plain senior defensive back Nate Pauly paces the Owls. GP went 5-1 in games decided by 15 points or fewer. Still, quarterback Alex Becker graduated, along with three of the top five rushers. Becker threw the game-winning two-point conversion against Hesston. Pauly had just 48 carries but led the team with 639 rushing yards (13.3 per carry) and six scores in 2015. He is the only receiver back with more than one catch and paced the team with 514 yards, seven scores, and 24.5 yards per catch. He was one off the team lead with 21 grabs. Overall, he led the team with 1,153 all-purpose yards and five interceptions. The Owl’s defense picked off 19 passes in 11 contests. The Owls are 4-0 versus Hesston, though last season’s meeting was the first matchup since 2007. Hesston has too much offensive firepower and earns the victory. For the third straight season, the Oilers and Knights meet in the season opener. Victoria is the two-time defending Eight-Man, Division II state champion, though the Knights move up to Division I this season. Central Plains won the Division I crown in ’13 and then went 9-2 last year. Victoria carries a 24-game winning streak into the contest with its last loss a 42-24 defeat at Central Plains to open the 2014 season. Last year, the two teams played a great contest that went down to the final seconds. Victoria held on for a 16-12 victory that eventually led to a 12-0 mark and the first time the storied program has captured back-to-back titles. Both teams are outside of the top-5 in Division I this fall following significant graduation losses, especially for Victoria. The Knights, which haven’t lost a home game since Week 2 of the 2012 season, return just two starters with linebackers Bryant Karlin and Cooper Pfanenstiel. Karlin, the leading tackler last fall, is expected to play in the backfield, too, along with Pfanenstiel. Junior Collin Kisner, a state medalist in the sprints, takes over at quarterback after he was the primary return man in ’15. Kisner has suffered significant injuries each of the past two seasons. Coach Doug Oberle called the toughest challenge creating cohesion in a brand-new offensive line. Five players have seen significant practice time at center/guard. Karlin and lineman Isaac Housley are the lone seniors. Housley, juniors Wyatt Engel and Lucas Taylor, along with sophomores Jacob Schroeder and Jake Wellbrock are in the mix up front. The quintet, along with sophomore Wyatt Dreiling, will play on the defensive line. The Oilers took big losses, too, namely with quarterback Braeden Crites. Crites threw for 5,364 yards with a 100/14 TD/INT ratio in his career. No Central Plains player returns with more than 120 rushing yards. Junior Alex Barton had 17 catches for 246 yards and five scores and is the lone Oiler back with more than nine catches. Senior Trey Schulte is a three-year starter. He led the team with six pancake blocks and delivered 11 TFLs. Barton recorded 78 tackles. Seven of the top-nine tacklers graduated. Central Plains has been much better at home, too, with just one home loss in the last three seasons versus three on the road. However, the Oilers have a size and depth advantage and have Barton, a talented player in all three phases. The key will likely be how Victoria’s line can block the veteran Schulte, who can wreak havoc up front.